Rebecca glanced around to make sure that nobody was approaching. She reached within a thin, vertical crack running alongside the side of a set of owl roots. Her fingers quickly found a length of wood, smoothed from use. She drew out a skinny broom and, her hands positioning themselves automatically, she began clearing a space among the piles of pellets, feathers, and droppings. She was quite aware that the wizarding world held brooms in a much higher regard than for cleaning. But, Hogwarts witch or not, she had been raised in a Muggle world. Brooms were for cleaning, not flying up to dizzying heights and chasing after unpredictable balls. However, she was always careful to keep her Muggle-like activities a secret to everyone. Well, almost everyone. A soft hoot and the slightest ruffling of feathers announced the arrival of her barn owl, Nyroc. He always brought a smile to her face, no matter what kind of mood she was in. She told her owl everything. At first, she had clung to him as the only thing related to her old life. Especially during her first year, the Owlery was Rebecca's safe haven. Perhaps that was why she kept an old, useless broom and actually performed manual labor with it. As the tough bristles pushed the debris aside, the swish swish reminded her of long summer days helping her mother in the yard as she swept the winding stone paths of their landscaped garden. Ironically, The first few weeks back at her real home were the hardest. After a summer of pretending to be normal and spending time with her parents, separately as usual, the longing for the past that had never completely gone away rebounded in full force. When she had cleared a large enough space for her to sit in, she stowed her broom away and leaned back against the wall. Nyroc settled on a stick the jutted out from the wall. Girl and owl, half-hidden by the shadows, one lost in memories of a happy home, and the other ready to help in anyway he could. Rebecca closed her eyes and let the memories flood her mind. This year, only a single tear leaked out onto her cheeks. Draco drug himself up towards the owlery. He was particularly exhausted but someone had to feed he bloody birds. He was in a rather off mood, with nobody to pick on in the entire school. That was expected though, being that most of the students hadn't arrived yet. He sighed, the bag of treats he carried was becoming rather heavy and the stairs weren't making the situation any better. He growled under his breath and shoved the bag onto the ground, pulling his wand from his pocked and casting a levitating charm. He began to make his way up the stairs again, stumbling over a stray rock or uneven step every now and then. It seemed like hours had passed when he finally made it to the top, levitating the bag slowly onto the floor. He casually began spreading the little biscuit shaped owl treats around the room, occasionally levitating them onto the wooden pillars stretching across the ceiling. Draco hadn't noticed the girl lurking in the shadows of the room, and he began to relax. The tall Slytherin backed himself against a wall, his head lolling to one side as he groaned. He hadn't much energy these days, everything ached and he felt like he was weakening. If Potter hadn't bloody cursed him he probably would be fine. Draco hissed as his chest began to throb. He clutched his shirt and slid down onto he cold flooring. He would have to either stop pushing himself and accept his weaker state, or push himself even more in hopes it would eventually help him heal. Plus the wave of curses his father had thrown at him before being locked in Azkaban didn't help. He shoved his wand into his robes and closed his eyes, he would need to rest before making his way back to the dorm rooms without passing out. "Pathetic little git.." He grumbled as he sat there, the incident in the bathroom replaying in his mind. A soft hoot alerted Rebecca that another person was approaching. Past experience had taught her the best ways to stay unnoticed, and by now her reactions were nearly instinctive. She remained in the same position, not even opening her eyes. Her mind was on alert, and her ears listened for signs of human presence. Finally, she detected faint footsteps lower in the tower. She relaxed and opened her eyes. "Thanks for the warning, Nyroc." She whispered. She crossed her legs and straightened against her wall, retreating fully into the shadows. Her hand grasped her wand and she laid it across her lap. She heard the occasional stumbling of whomever was approaching, and she figured that the person was not the best physical condition. Rebecca kept her eyes trained on the entrance to the owlery, and soon enough, a tall blond-haired boy appeared. He had on Slytherin robes and an unhappy expression. Rebecca's heart beat a little faster. Slytherins, especially the older ones, had a reputation of being the bullies of the school. However, it seemed that this one had brought a large bag of owl treats, which he distributed almost carelessly. Perhaps that was one of the reasons why he hadn't noticed Rebecca. He was only there to feed the birds. The boy leaned against a wall and groaned. His face contorted as he clutched at his chest and slid down, obviously in pain. He mumbled something that Rebecca couldn't make out as he closed his eyes. Rebecca stared at him, trying to assess the situation. He didn't know she was here. If she left now, no one would ever know. But could she make it out without awakening him? For all she knew, he was waiting for a chance to pounce. However, the pain and discomfort on his face had seemed very real. What if this was a place for the Slytherin to show weakness, where no one could see? Fear gripped Rebecca's heart as she thought of what he could do her. He was older and knew many more spells. No doubt some nasty hexes. She looked at Nyroc, who stared back her with that heart-shaped face. Finally, after what seemed like eons, Rebecca stood carefully. She slowly brushed off a few stray feathers from her robes but remained in the shadows. She cleared her throat and waited tensely for the Slytherin's response. Draco's eyes shot open as he heard someone moving, his steel gaze scanned the other side of the room but he made no attempt to draw his wand. He shifted a bit, grabbing one of the windows for support to pull himself up off the floor. He stood there silent for a few minutes, finally drawing his wand to silently cast the illuminating spell. He flicked his wand and the light from it drifted up towards the ceiling, settling at the top and lighting up nearly the entire room. "Who's there?" he spat out, trying to sound intimidating despite his obvious health issues. He could make out the silhouette of another person though he couldn't make out the robes they were wearing, or if they were wearing robes. His heart began to pound in his chest as he gripped his wand harder, holding it down as to not scare the person. He flinched as his chest began to ache again, the lingering effects of the 7 cruciatus curses his father had hit him with when the war was over. Knowing the pain would fade in a matter of seconds he took a step forwards, it obviously wasn't Potter, if it were, he'd already be rambling on about being friends and whatnot. He took another step, waiting for the stranger to respond. Rebecca forced her nervous heart to quiet as the boy heard the sound. He apparently couldn't see her, and she made a mental note that the shadows at this time of day were perfect to hide in. After a few minutes, Rebecca watched as he flicked his wand. Without a word, light flew from the want tip to the top of the tower. The shadows were instantly cut by at least half, and Rebecca knew she was hidden no longer. Then the Slytherin spoke. His voice was harsh, and its strength was completely opposite to his body's condition. As the thought flitted through her mind, the blond boy flinched once more. He stepped forward, paused, then stepped forward again. Rebecca wished that her stomach would quit writhing, it made her even more nervous. She was unsure of how to respond to this weakened boy. Maybe it was a result of reliving her most fond memories, but her mother's sweet voice echoed in her mind. 'We all have prejudice. We're human. But don't let that discrimination affect your relationships with other people.' An image of a crowded homeless shelter flashed through Rebecca's mind. With a sincere sense of guilt, she realized that the sole reason this boy made her so afraid was because of the robes he wore. She had been raised better than this. Gathering up all her courage, she took a bold step forward. Her blond bangs obscured her eyes as she looked down, suddenly shy. What would she say? 'Sorry for spying?' Yeah, that would work real well. She thought to herself. "I'm sorry if I startled you." Although her pose implied that she was looking down, her eyes stared through her hair, nearly the same shade as the boy in front of her. Draco watched as the person in question stepped forwards. His eyes widened slightly as he studdied her. She seemed almost reluctant to speak, she was obviously rather shy. His steel eyes scanned over her as she stood there, moments passing that seemed like hours to Draco before she finally spoke. A small smile tugged at the corners of his lips. She looked a lot like him, if he were a girl that is. The tall slythrin sighed, relaxing a bit as she apologised. "It's alright, thought you were...". He cut himself off as his breath hitched. "Uhm, what brings you to the owlery?" he questioned, deciding a swift subject change was in order. Draco wasn't ready to talk about the things that had happened during the war. His face paled a bit as he sighed. He couldn't handle the memories himself, what would this complete stranger think if she knew what he had been through. What would she think if she found out he was a death eater.. He groaned and grabbed his left arm, the dark mark squirmed at his touch beneath his robe which sent a wave of shivers down his spine. It was still active, though....Voldemort....was dead. He snorted a bit and brought his focus back to the girl, not wanting to be thrown off guard in case she decided to hex him into the following semester. Rebecca saw the corners of his mouth move, and then she lifted her face. He sighed, his sentence trailing off. Perhaps he was expecting a special someone? He spoke again, his tone more neutral than before. Rebecca tilted her head the slightest bit. She definitely wasn't going to tell him the real reason. Her voice faltered as she quickly improvised. "I...uh...came to check on Nyroc. My owl. There." She waved in a vague direction behind her. She wasn't exactly lying, she had come up to settle him in. She stood there awkwardly. There was something weird going on with this boy He kept clutching on parts of his body, as if they had suddenly began throbbing. "Are...are you alright?" She ventured cautiously, hoping that he wouldn't think she was patronizing him. She desperatly wanted to leave this awkwardness behind, but if he was hurt she couldn't bear to leave him behind as well. "I'm...fine. Remnants of...a curse." The Slytherin sighed a bit as his expression softened. He hadn't told anyone what his father had done. "The cruciatus curse, I'm sure you've heard of it." He smiled weakly. He was tempted to loft his shirt, to reveal the scarred skin that was hidden by the garments. Nobody had ever seen his body, his scars, he didn't dare show them to a stranger. Instead he shoved his hands into his pocket. His tongue darted out, trailing swiftly along his lower lip. He pulled his eyes away from her, looking down instead to kick at a rock, watching it skid across the floor. Thankfully, the blond Slytherin didn't seem to take offense to her question that implied weakness. Cruciatus... She thought nervously. She had learned about them from her evening haunts in the library, where she continued to make her way through the shelves. Forbidden books included. This boy had been tortured, most likely during the Wizards War. She suddenly put two and two together, and realized the identity of the teen. He was Slytherin. He had gone through the War. He looked young enough to be in his seventh year at Hogwarts. 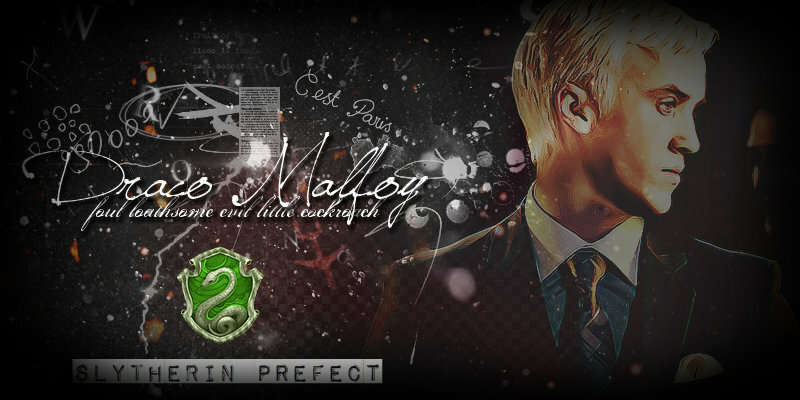 He was Draco Malfoy. Infamous, misunderstood, confused Slytherin who was known for butting heads with the most famous wizard of all. Rebecca's heart beat faster, but she forced her expression to remain the same. Quickly, she nodded confirmation. "I've heard of it." She answered softly. They stood there awkwardly for what seemed like eternity, when the silence was broken by a few owls whooshing in. Rebecca ducked her head as sharp talons glided through the space her head had been, landing on a perch it was obviously familiar to. More students. She concluded. "Well... I better get going, before some first years take my bed." She said awkwardly. "Um...if you need someone to talk to, Nyroc's there." She said, her face flushing. "I mean, my owl, letters, yeah. Or his cubby.Or if you want to talk to him, he's a good listener." She ducked her head in embarrassment and turned to leave. Draco smiled half heartedly. She must have figured out who he was. He hadnt mentioned his name for this purpose. When most found out who he was they tended to ignore him or worse, beat him till he couldnt move. He was an ex death eater and whoever knew him knew that. He put on a fake smile as the girl dismissed herself. "Alright, it's been a pleasure..speaking with you that is. Best of luck fending off those pesky first years." Draco retreated to the wall he had been leaning against before, pressing his back against it gently. Not realizing the girl hadnt yet left he rolled back his sleeve, staring at the dark mark that wriggled against his skin. The accursed mark seemed to hiss as he ran his finger over it. Rebecca heard his voice and turned automatically. His voice seemed more resigned, like he was being this nice just because it was polite. Her eyes were immediately drawn to his arm, where his finger was rubbing. It was a dark mark that seemed to be etched into his skin. Death Eater! It took all of her self control not to make a sound. He obviously thought that she had already left, and she didn't want to startle him again. She carefully and silently turned back around and made her way softly down the stairs. As she spiraled down, her thoughts wandered back to the blond boy she had left upstairs. That mark, that permanent tattoo, made Rebecca sure that he was indeed Draco Malfoy. She felt an unexpected pang of sympathy for him. Tortured by his own father, and sending people running whenever they realized who he was. Maybe she would write him a letter. Introduce herself better, and prove that she wasn't going to be scared of his name anymore. Leave it with Nyroc, in case he made good on her offer. Of course, if he never came up here again she wouldn't mind. She felt like the owlery was the only place where she could be free from the scrutinizing gazes of the other students, and away from the heavy, boring textbooks scattered everywhere in a Ravenclaw girl's life. Taking a deep breath as she stepped out into the open air, she made her way back up to the common room to stake out a bed.